Dwight Eisenhower was the 34th President of the United States who served in office from January 20, 1953 to January 20, 1961. What was the life of Dwight Eisenhower like? The short biography of President Dwight Eisenhower covers important information and facts about his early life, his family, career and the famous events and achievements of his political life. 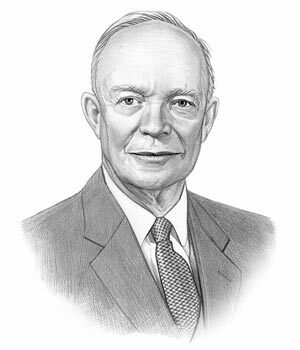 Our short biography of Dwight Eisenhower provides an interesting and easy way to learn about the life of the President. The following important facts provide a fast overview of important facts about President Dwight Eisenhower. Facts and Info: Dwight D. Eisenhower was the 34th president of America who led the nation to the end of the Korean War and steered a moderate course during the Cold War. For additional info refer to 20 Facts about Dwight Eisenhower. Facts and Info: He was born on October 14, 1890 in Denison, Texas. He was raised in poor family and lived in a modest house by the railroad tracks. His father was a college-educated engineer but found it difficult to find work and made a living as a mechanic. Dwight D Eisenhower died on March 28, 1969 in Washington D.C.
Facts and Info: The career of Dwight D Eisenhower included the roles of Soldier, Politician and Statesman. He had a good education and went on to study at the U.S. Military Academy and West Point where he graduated first in his class of 245 officers. He achieved the rank of a five-star General of the Army and was a hero of World War II. He became the 34th President of America in 1953 and served for 8 years until 1961. Facts and Info: Dwight D Eisenhower married Mary “Mamie” Geneva Doud on July 1, 1916. They had 2 children whose names were Dwight and John Sheldon Doud who died of scarlet fever at the age of three. Many rumours circulated that he developed a relationship with Kay Summersby. Facts and Info: Dwight D Eisenhower belonged to the Republican Political Party. He was 62 years old when he was inaugurated as the 34th president. Inauguration is a President's swearing-in ceremony. His nickname was “Ike” which was used in his famous campaign slogan "I like Ike". Richard Nixon stood as the Vice President. For additional facts refer to his Presidential Cabinet members. Short Biography of Dwight Eisenhower: What he was like! Facts and Info: Dwight D. Eisenhower was 5 feet 10 inches in height and weighed approximately 178 lbs. He had light brown hair before he went bald, blue eyes and a fair complexion. His most distinctive feature was his broad grin. He was very well travelled due to his highly successful military career in which he reached the position of supreme commander of Operation Overlord, the Allied assault on Nazi-occupied Europe. The presidential retreat, called Shangri-La was renamed to Camp David (after his grandson). Facts and Info: During his lifetime he played a key role in important events of the era. Dwight D Eisenhower was instrumental in the closing stages of the Korean War which ended in 1953. In 1954 the Brown v. Board of Education legal dispute resulted in the US Supreme Court declaring that separate public schools, for black and white students, was unconstitutional. In 1957 Eisenhower ordered Federal troops to Little Rock to enforce integration. As the Cold War continued a speech referred to as the Eisenhower Doctrine was made in 1957 to limit communist expansion. Facts and Info: During his life Dwight D Eisenhower suffered from Appendicitis, Arthritis, Crohn's disease, anxiety and depression. He also suffered from heart disease & experienced multiple heart attacks. Crohn's disease is an inflammatory disease of the intestines which is associated with ulcers. Facts and Info: Dwight D Eisenhower died of coronary thrombosis on March 28, 1969 in Washington D.C. He was 78 years of age. The state funeral of the President was held at Abilene, Kansas where he was also buried. The short biography of Dwight Eisenhower provides a fast overview of the key facts and events about his life and the accomplishments of his presidential term in office. The following Dwight Eisenhower video enables you to sit back and listen to the history of his personal and political life - a useful educational resource for kids, children and schools learning about the life of President Dwight Eisenhower.